Quick and hassle free - no registration needed! While in Taipei, don't miss out on Taipei 101 Observatory and Taipei Double Decker Bus Tour! It was easy to find the shop and fast to get the card installed. Stay constantly connected while you're on the go in Taiwan with an unlimited 4G data SIM card! You'll be able to communicate with your friends and family, navigate your way around the country and keep up to date with the latest events without incurring steep roaming costs. 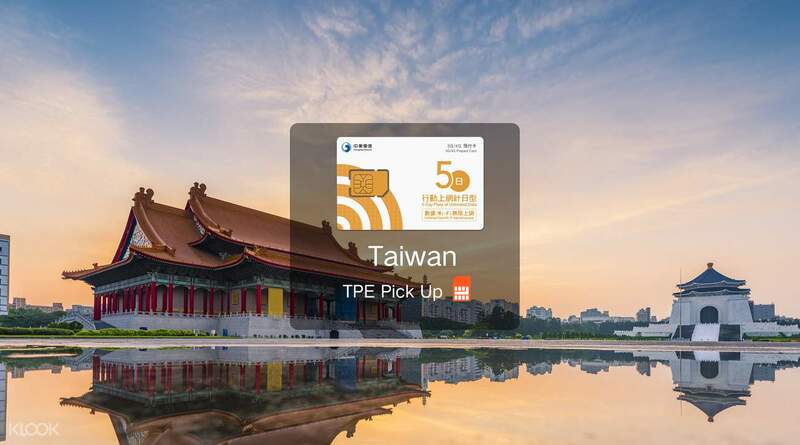 This 4G SIM card has a wider coverage, so you'll have connection in more off-the-beaten-path parts of Taiwan such as Lanyu (Green Island), Penghu and Kinmen. With instant booking confirmation, convenient pick up service of Taiwan 4G SIM card at Taipei Taoyuan International Airport and no registration process, you will have island-wide coverage from the moment you land in Taiwan. If internet connection is still unavailable once you activate the card, please set your APN to "internet"
Convenient and service was vey good. Didnt lose My way unlike other services that i bought previously. Instructions were clear and easy go find as well. Worth the buy! Connection wasnt laggy Or anyt as well would definitely purchase again for my other trips! Easy to activate too! Enjoyed my Trip becus i could use my connection of 4G was stable and i could use instagram to take videos and all! Convenient and service was vey good. Didnt lose My way unlike other services that i bought previously. Instructions were clear and easy go find as well. Worth the buy! Connection wasnt laggy Or anyt as well would definitely purchase again for my other trips! Easy to activate too! Enjoyed my Trip becus i could use my connection of 4G was stable and i could use instagram to take videos and all! Availing the sim card via Klook was so easy. The confirmation email was sent to me, and just presented it to the booth to get the sim card. The personnel of Chunghuwa Telecom was so helpful. The sim card was ready to use and the connectivity was so fast. I was able to enjoy the connection all day long, all throughout my 10-day stay in Taipei. By the way, the connection was great too when we travelled to Yehliu Geopark! Availing the sim card via Klook was so easy. The confirmation email was sent to me, and just presented it to the booth to get the sim card. The personnel of Chunghuwa Telecom was so helpful. The sim card was ready to use and the connectivity was so fast. I was able to enjoy the connection all day long, all throughout my 10-day stay in Taipei. By the way, the connection was great too when we travelled to Yehliu Geopark! The staffs are helpful and friendly . Overall experience is great and efficient. If you’re landing at TaoYuan airport Terminal 1 , just turn right once come out from the immigration exit, then you will be able to see an area written “ Telecommunication service “then you will be spot ChungHwa counter easily as it’s at the centre of this area. The staffs are helpful and friendly . Overall experience is great and efficient. If you’re landing at TaoYuan airport Terminal 1 , just turn right once come out from the immigration exit, then you will be able to see an area written “ Telecommunication service “then you will be spot ChungHwa counter easily as it’s at the centre of this area. unite traveler 4g sim card is the best thing that i have in my taiwan trip. 4G connection to the top of the mountain is amazing, real time story for social media while hiking, visiting a water falls or even when you are lost in the forest. Purchasing it on klook makes it more easy and fast. I enjoyed it a lot! thanks klook! stay connected anywhere guys. unite traveler 4g sim card is the best thing that i have in my taiwan trip. 4G connection to the top of the mountain is amazing, real time story for social media while hiking, visiting a water falls or even when you are lost in the forest. Purchasing it on klook makes it more easy and fast. I enjoyed it a lot! thanks klook! stay connected anywhere guys. The sim card help us to be able to stay online anywhere we go across taiwan. The internet was fast and reliable. Pick up at Taoyuan Airport T1 was convinient. p.s. just make sure that your phone provider allows you to used other networks sim card. On my friends case she wasnt able to use hers because she's on a postpaid plan. The sim card help us to be able to stay online anywhere we go across taiwan. The internet was fast and reliable. Pick up at Taoyuan Airport T1 was convinient. p.s. just make sure that your phone provider allows you to used other networks sim card. On my friends case she wasnt able to use hers because she's on a postpaid plan. When travelling everyone needs data, to check the map so you will not get lost. Purchasing this simcard from klook help us a lot during our taiwan trip. We we’re able to check the buses schedules and mtr as well. Thank you klook for always giving a conveniencedurint our travel abroad. When travelling everyone needs data, to check the map so you will not get lost. Purchasing this simcard from klook help us a lot during our taiwan trip. We we’re able to check the buses schedules and mtr as well. Thank you klook for always giving a conveniencedurint our travel abroad. Thanks, Klook! It was our first time in TW and we were able to get around Taipei for 4 days by just checking Google maps by the help of the unlimited data valid for 5 days! It was a steal! This is a must-have when you visit Taiwan. Thanks, Klook! It was our first time in TW and we were able to get around Taipei for 4 days by just checking Google maps by the help of the unlimited data valid for 5 days! It was a steal! This is a must-have when you visit Taiwan. Very useful indeed! Very fast internet with more than 30mbps speed with signals everywhere in Taiwan even underground inside the train. Easy to claim and use. Just pop into your phone and you’ll immediately be able to use it. Also cheaper online to buy it. Very useful indeed! Very fast internet with more than 30mbps speed with signals everywhere in Taiwan even underground inside the train. Easy to claim and use. Just pop into your phone and you’ll immediately be able to use it. Also cheaper online to buy it. The counter is just outside of arrival hall to the right. You will need to sign a few documents and the network is ready once you place the SIM card into your phone. Very convenient and will book again once out family travel to Taiwan again. I even got some discount during klook promotion. It was RM 25 instead of RM 40. With the network available across the whole Taipei, you can easily travel to your destination. The counter is just outside of arrival hall to the right. You will need to sign a few documents and the network is ready once you place the SIM card into your phone. Very convenient and will book again once out family travel to Taiwan again. I even got some discount during klook promotion. It was RM 25 instead of RM 40. With the network available across the whole Taipei, you can easily travel to your destination. Q: Can I top up the SIM card to use it again after the expiration date? A: No. This SIM card cannot be topped up again for reuse once it has expired. Q: I chose the wrong card size. Can I change it to the right one? A: Yes. You will be able to change the SIM card size at the counter when you pick it up. Q: Does this SIM card provide unlimited data? A: Yes, you'll get unlimited data and speeds that won't slow down. Q: Can I make international phone calls? A: Yes, international calling is enabled, however it is expensive so we wouldn't recommend it. Q: If I'll stay in Taiwan for 17 days, can I book a 10 day SIM Card plus a 7 day SIM Card? A: No. Each person can only redeem 1 card with 2 forms of photo ID. So If you want to use the SIM card for 17 days, you can book 2 cards by showing 2 people's photo ID (4 forms) when you redeem your cards. Q: Is this the 'Ideal Card' (prepaid card) provided by Chunghwa Telecom company? A: This SIM card is provided by Chunghwa Telecom Company, but it's the 'Unite Traveler' card not the 'Ideal Card'. Q: Can I insert this SIM card into a WiFi router to share the Internet? A: No, you cannot. The size is different, so you cannot use it in a WiFi router. Q: Do I have to pick up my SIM on the exact same date I choose when booking? A: No, but if you decide to pick your SIM up on a different date than your chosen date, please inform customer service.